Who had an AMAZING Birchbox for the second month in a row? ME! I was so excited to post about it that I just used my iPhone to take all the photos. If you love getting to try new products out (especially cosmetic products) then I suggest jumping on the Birchbox bandwagon! I’ve been getting the boxes for a few months now ($10 a month) and have found a few products I really enjoy (and have become purse staples). I thought I would just do a quick post on what I got for this month’s box and by all means if you’re interested go and sign up! I would love it if you did it via my affiliate link: Birchbox Affilate because I can then earn points. I’m all about reward systems! Seriously. SERIOUSLY. I feel like they’ve upped their game lately! This is my first RUFFIAN brand nail polish and although the bottle is different than what I’m used to, since the cap has that ball area, the color is gorgeous! 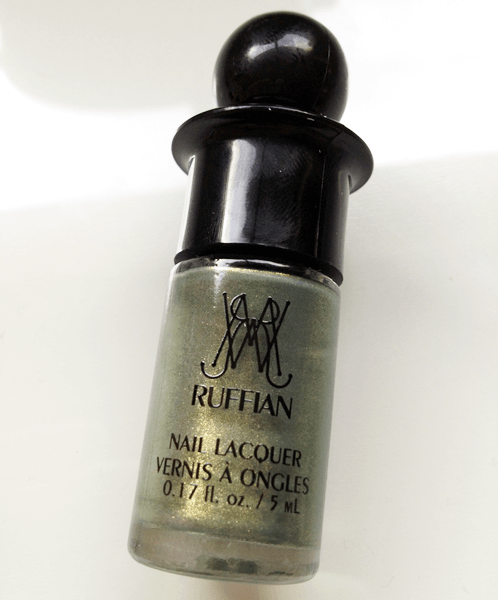 A muted olive golden green with golden shimmer. Spot on for Fall too. Ahh this lipgloss is so pretty! Not gritty or sticky and yet it’s packed full of sheer shimmery goodness. I love that I got a neutral shade because this is going to be a purse staple. I’m happy that I have two hand products since we all know I love my nail polish and the glove looks very interesting. You’re supposed to put the gloves on, wait 10 minutes, tear the fingertips off, and leave the gloves on while you do your nails. The theory is you’ll be left with totally hydrated and softened hands after you’re done with your manicure. The hand cream is going straight to my purse. I moisturize my hands often and ran out of my normal hand cream about two weeks ago. Cuticle oil is not a replacement for hand cream and I’ve learned this the hard and messy way! work on both damp and dry hair and performs a variety of functions, protecting, nourishing, smoothing, and volumizing hair. This lightweight spray can be applied to damp hair before blow-drying to provide heat protection, texture, and lift. It also serves as a light hold mist for dry hair and can facilitate restyling. In keeping with its multipurpose personality, it works on all hair types, including color-treated hair. I’m curious about this, since I find a lot of heat protecting type products tend to leave my hair a bit sticky so I’ll have to see how this works next time I decide to flat iron my hair! 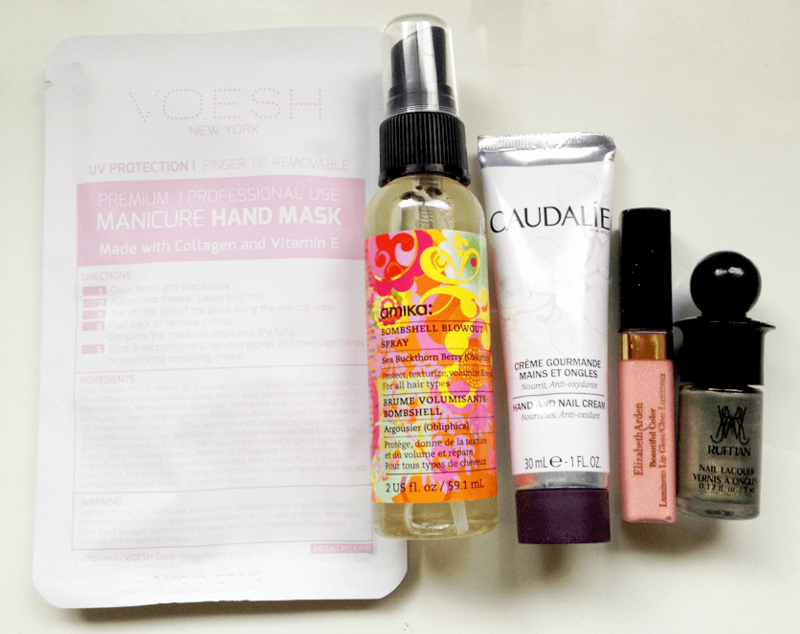 Overall, I am super thrilled with this month’s Birchbox, I can’t wait to see what they will do next month! Love that nail polish! Love! And I’m also interested in that heat spray. Mine leaves my hair feeling a little greasy. It’s so hard finding a GOOD heat protector! Either it’s oily, or makes my hair crunchy, or it’s too creamy… I am curious how this one will hold up. By the gods girl do you have to keep showing me new things to get? Yes. Yes I do. Must bring everyone over to the dark side LOL! But I don’t have the money though lol. I might switch out my Julep subscribe for this or the other one. I just haven’t been as crazy fond of the Julep monthly boxes lately. Partly because some of them have their more new texture (salted?) polishes and I can not STAND textures on my nails lol.